We don’t teach to give children facts. We teach to change lives, right? If we want our lessons to impact kids’ lives beyond Sunday, we MUST capture their imagination and bring our lessons to life! Let me share some tips on how to do this using my current series as an example. This month I am starting a new series on the Armor of God. It is one of my favorite series’ to teach, and I do it differently every time. I have a “secret agent” series on Kidology.org that I am loosely following, but anytime I teach, the creative juices get flowing and new ideas are sure to abound! This time around, thanks in large part to my teaching partner, Micah, we are doing something extra crazy! 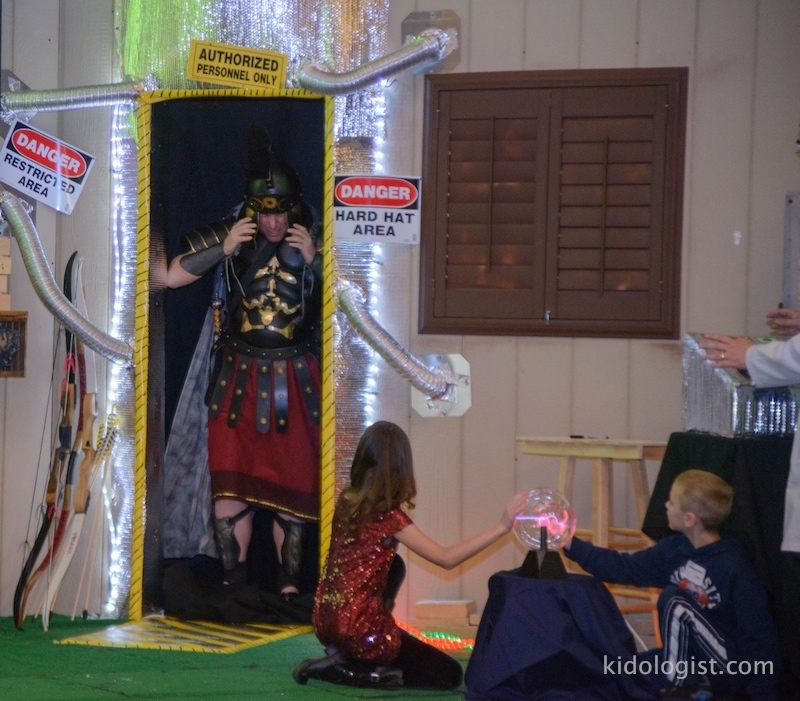 Micah had a complete suit of armor custom built for himself, so we decided to build a TIME MACHINE and bring a real Roman Soldier through time to help explain the functions of armor to the children before I compare them to the items God has equipped us with to fight our spiritual battles. No matter what you are teaching, it is important to capture the imaginations of children! It draws them in and makes learning fun! 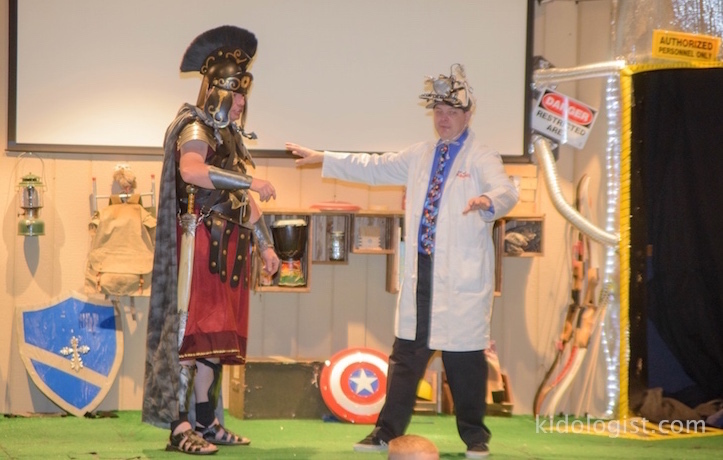 Rather than just have the Time Machine appear on the first week, we teased it with a really fun lesson that had kids (and parents) anticipating it all week. (You can watch the full lesson here.) I had parents calling, e-mailing and mentioning to me how much their kids couldn’t wait until next Sunday! So, how do you capture kids’ imagination? 1) You need to foster YOUR OWN imagination! Don’t get stuck in a rut. Every time you set out to teach, ask yourself, “What can I do differently this time?” Don’t be predictable. Be bold, creative and even a little crazy! If you need help – ask some kids. But you aren’t just trying to create a lesson, you are trying to create memories. I want kids to remember this series years from now. That way, they will also remember what they learned. 3) Think about how you can create an EXPERIENCE for kids, not just something for them to watch or listen to. We learn by what we DO and what we experience. Kids are wired by God to DO and experience. Create an experience and they will be engaged and love learning! Let me close with a question and challenge – what really creative and crazy thing have you done lately to break the mold to make your teaching an experience for your kids? Do you need to introduce a new teaching technique? A new character? A new curriculum? A new set? Move to a new room (or just face another direction)? Do you need to invest in some cool props or change the predictable flow of your lesson format? Shake things up! And above all, unleash your imagination and let the kids learn through using theirs! PS: Here is a TOP SECRET LINK to my Time Machine Video. This isn’t available on YouTube in a general search or visible on my channel because it is set to private. You can only get it from this direct link. Enjoy! Now go build a Time Machine! I Was a Corporate Spy, Really!